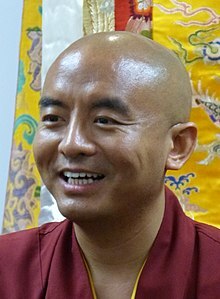 Yongey Mingyur Rinpoche (/ˈjɒŋɡeɪ/; born 1975) is a Tibetan teacher and master of the Karma Kagyu and Nyingma lineages of Tibetan Buddhism. He has authored two best-selling books and oversees the Tergar Meditation Community, a global network of Buddhist meditation centers. Mingyur Rinpoche was born in Nepal in 1975 the youngest of four brothers. His mother is Sönam Chödrön, a descendant of the two Tibetan kings Songtsen Gampo and Trisong Deutsen. His brothers are Chokyi Nyima Rinpoche, Tsikey Chokling Rinpoche, and Tsoknyi Rinpoche and his nephews are Phakchok Rinpoche and the reincarnation of Dilgo Khyentse Rinpoche, known popularly as Khyentse Yangsi Rinpoche. From the age of nine, his father, Tulku Urgyen Rinpoche, taught him meditation, passing on to him the most essential instructions of the Dzogchen and Mahamudra traditions. At the age of eleven, Mingyur Rinpoche began studies at Sherab Ling Monastery in northern India, the seat of Tai Situ Rinpoche. Two years later, Mingyur Rinpoche began a traditional three-year retreat at Sherab Ling. At age twenty, Mingyur Rinpoche became the functioning abbot of Sherab Ling. At twenty-three, he received full monastic ordination. During this time, Mingyur Rinpoche received important Dzogchen transmissions from Nyoshul Khen Rinpoche. At the age of nineteen, he enrolled at Dzongsar Institute, where, under the tutelage of the renowned Khenpo Kunga Wangchuk, he studied the primary topics of the Buddhist academic tradition, including Middle Way philosophy and Buddhist logic. (with Helen Tworkov) Turning Confusion into Clarity: A Guide to the Foundation Practices of Tibetan Buddhism ISBN 978-1-61180-121-7, Shambhala Publications under its Snow Lion imprint. In Love with the World: A Monk's Journey Through the Bardos of Living and Dying. ^ "Kathmandu Tergar Osel Ling Monastery". Tergar.org. Retrieved May 29, 2013.